Laurel Glen Vineyard, a thousand feet up on east facing slopes of Sonoma Mountain, has long been considered one of the iconic Cabernet vineyards of California. Originally planted in the 1880’s; the present day vineyard was developed in the 1970’s by Sonoma wine pioneer Patrick Campbell. The vineyard’s combination of high altitude, eastern exposure, rocky soils, and small diurnal temperature swings combine to produce very distinctive wines. Laurel Glen is a recognized clonal variety available through UC Davis’ horticultural department. Organic farming practices were 1st introduced in 2011 and Laurel Glen Vineyard received organic certification in 2014. Even more consequential were the changes made in trellising and pruning practices. Since 2011, Laurel Glen Vineyard has been cane pruned using a Double Guyot trellising method favored in Bordeaux. Also since 2011 the irrigation has been greatly reduced and with few exceptions Laurel Glen Vineyard has been dry farmed. The many refinements made in the vineyard have resulted in better concentration and consistency of the fruit. Vintage Comments: A warm winter and spring in 2014 caused early bud break, followed by beautiful mild weather in summer that allowed for long, even ripening and excellent flavor development. Picking started on September 17 and ended on the 23rd, the earliest Cabernet Sauvignon harvest our winemaker Randall has seen in his 20 plus years of winemaking! Despite drought conditions and a 6.0 magnitude earthquake on August 24, the quality of fruit was excellent. Special Comments: The vineyard earned CCOF Organic Certification in 2014, thanks to the efforts of Viticulturist Phil Coturri. Winemaker Randall Watkins and consulting enologist David Ramey took over winemaking in 2011 and introduced careful cluster and berry sorting techniques to increase the opulence and polish of the wine. The fruit undergoes maceration for two to four days untilnatural fermentation begins in small open-topped stainless steel fermenters. Using a combination of pumpovers and punchdowns to target the elegant skin tannin and reduce seed extraction. 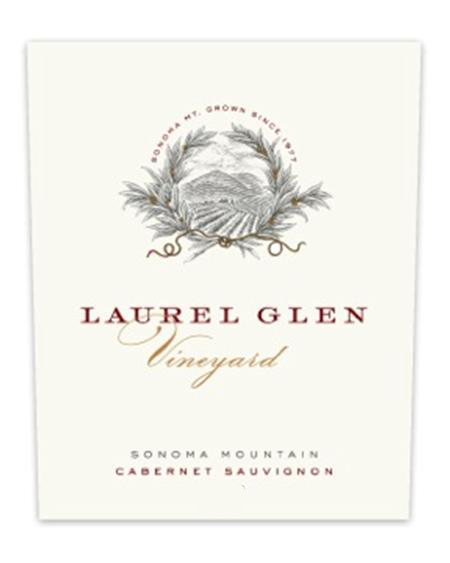 Laurel Glen Vineyard Cabernet Sauvignon is 100% free run – no press wine was used in the blend. The wine is aged about 23 months in all Tonnellerie Taransaud French oak barrels (50% new).